Many people have an Echo dot or an Amazon Echo device that has Alexa. The voice-controlled devices have a small built-in speakers and connects to the Alexa Voice Service to play music, provide information, news, sports scores, weather, and more. 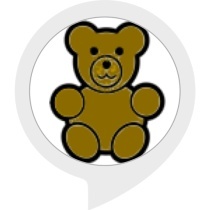 I discovered a few Alexa skills that are perfect for helping kids with therapy needs or with development of underlying skills that impact independence and safety. 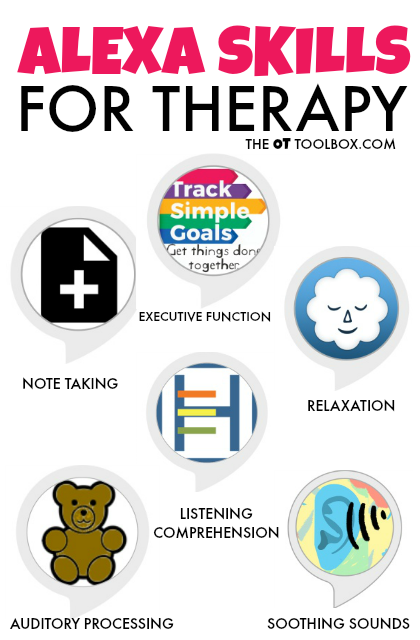 Use these as an occupational therapy tool! 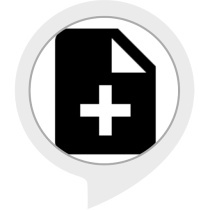 These Alexa skills are free to set up and use on your Echo Dot or Amazon Echo device. There is so much that can be done with the Amazon Echo and other devices that connect to Alexa voice service! Click here to find out more about all that these devices can do. They can be used in any room of your house using Bluetooth. Alexa devices like the Echo Dot, Amazon Echo, and Bluetooth-enabled speakers are excellent tools for addressing the developmental needs of kids. 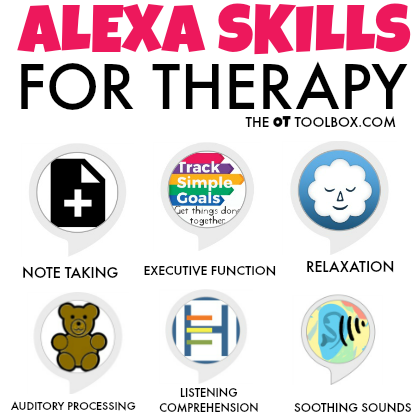 You can use free Alexa skills to address needs such as safety, sensory processing, and executive functioning skills right at home. Ask My Buddy is a free Alexa skill that lets you immediately alert someone in your Personal Alert Network that you need them to check on you. All you need to do is say, 'Alexa, Ask My Buddy to alert YourContact' or 'Alexa, Ask My Buddy to alert everyone', and Ask My Buddy will immediately send an alert, notifying them to check on you right away. Alerts will be sent by text message / SMS, an email, and even a voice telephone call. Ask My Buddy is not a substitute for 911, but rather an additional tool offering the security of knowing help is just a shout away. This is perfect for older folks who live alone or young teens that are just starting to stay at home on their own. Click here for directions to set up this Alexa skill. 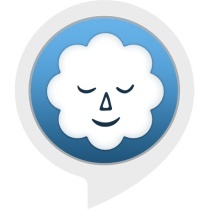 ASMR Sounds is a free Alexa skill that provides auditory sensory input to calm and relax you. ASMR stands for autonomous sensory meridian response. This app provides soothing sounds that relax your mind and body. It would be a great sensory break or perfect to use before bedtime. 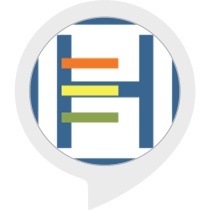 Click here to set up this Alexa skill. 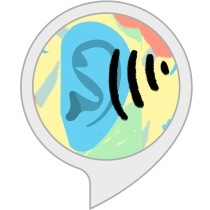 Listening Comprehension Practice is an Alexa skill that is perfect for kids or adults who are working on auditory processing skills. The free app allows listeners to sharpen their comprehension of audio narrative content by providing a short audio narrative followed by interactive comprehension questions. The listener must respond to the questions and Alexa will verify if the response is correct. 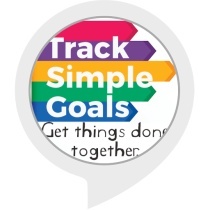 Goal Tracker by Hoogalit is a free Alexa skill that tracks goals. From chores, to doing homework at a specific time, to completing parts of a sensory diet-this goal tracker will keep kids on target. It looks like the skill works best with simple goals, but it's an option to try for kids with executive functioning problems. My Note-taking Skill is a free Alexa skill that creates notes in note-taking services, such as Evernote and OneNote. This is a nice tool for kids with handwriting difficulties including dysgraphia. Use it to add items to your to-do list as soon as you think of them. Meditation Timer provides timed soundscapes that evoke feelings of calm and relaxation. Sounds such as a peaceful forest, ocean waves, or falling rain are a calming auditory sensory tool to help kids relax.